Don Drysdale turned an at-bat into nasty business. He stood six-feet, six-inches and hurled 95 mph sidearm heat. The Dodgers right-hander struck out 2,486 batters in his 14-year career and hit 154. You’ve heard of an uncomfortable 0-for-4? Drysdale was a terrifying 0-for-4. Drysdale liked to talk about his 2-for-1 policy. You hit one of my guys, he’d say, I’ll hit two of your guys. Drysdale didn’t like to issue intentional walks. He’d rather drill the guy and save three pitches. Big D glared at hitters the way a drill instructor glares at buck privates. He looked like a tiger in need of a steak. He squinted in for the sign like a great white shark squints to find a lonely surfer. Batting against Drysdale was like a day at the beach. On jellyfish day. He hit guys like Joe Louis hit pikers from Palookaville. Drysdale hailed from Van Nuys, Calif., born July 23, 1936, a Valley boy from a different time. He probably scared off half the kids from Burbank and Sherman Oaks. The Brooklyn Dodgers signed him in 1954 for a $4,000 bonus and $600 a month. 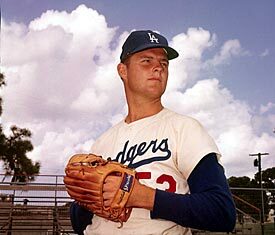 The Dodgers promoted Drysdale to the big club in 1956, a 19-year-old, all arms, legs and fastball. He promptly went 5-5 with a 2.64 ERA (152 ERA+) in 99 innings. The kid was good. The next year, he went 17-9 with a 2.69 ERA (153 ERA+). In 1958, the Dodgers moved to L.A. The California guy went home. In 1959, Drysdale won 17 games and struck out 242 batters, the most by a National League pitcher in 35 years. He led the Dodgers to a World Series title against the Chicago White Sox. Over the next decade, Drysdale solidified his Hall of Fame career. He only led the National League in wins once, but topped it in strikeouts three times. No. 53 fanned a career-high 251 in 1963. He hit the 200 strikeout mark six times. Drysdale and Sandy Koufax made a magnificent 1-2 combo. Koufax, left-handed and elegant, Drysdale, right-handed and fierce. They started games in the warm twilight at Dodger Stadium, hurling unhittable pitches fired into sunlight and shadow. For opposing line-ups, it was more like a California nightmare than a California dream. In 1962, Drysdale won 25 games and took home the Cy Young Award. He finished fifth in the MVP voting. Drysdale and Koufax led the Dodgers to World Series championships in ‘63 and 1965. They didn’t get much help from the offense. The Dodger attack was about as scary as your cousin Sissy’s pet beagle. The Dodgers made it home about as often as Robinson Crusoe. Drysdale probably put up his best year in 1964. He compiled an 18-16 record, but he attached a 2.18 ERA (147 ERA+) onto that over 321.1 innings, a career-high. He gave up an average of just 6.8 hits per 9 innings, a career low. In 1968, in his next-to-last season, Drysdale set a major league record. He threw 58 2/3 consecutive scoreless innings and put up a 2.15 ERA (128 ERA+). And, if he threw a few extra spitballs that year, well, then so be it. He wasn’t the only one. Big D started off 5-4 in 1969 with a 4.45 ERA. His strong right shoulder had thrown enough. He called a press conference, shed some tears and said he was done. Drysdale, who looked a movie star, retired with a 209-166 record and a 2.95 ERA (121 ERA+). He tossed 49 shutouts and hit 29 home runs. Drysdale took the ball every game and led the league in starts from 1962-65. He made eight All-Star teams. Retired from playing, Drysdale turned to broadcasting. He called games for a number of teams including his beloved Dodgers. The writers finally voted him into the Hall of Fame in 1984. Donald Scott Drysdale, you were one tough pitcher. Source/Don Drysdale won 209 games in his career and hit 154 batters. He glared at hitters the way a drill instructor glares at buck privates. He looked like a tiger in need of a steak. He squinted in for the sign like a great white shark squints to find a lonely surfer. Drysdale hailed from Van Nuys, Calif., born July 23, 1936, a Valley boy from a different time. He probably scared off half the kids from North Hollywood and Sherman Oaks. The Brooklyn Dodgers signed him in 1954 for $4,000 and $600 a month. The Dodgers promoted him to the big club in 1956, a 19-year-old, all arms, legs and fastball. He promptly went 5-5 with a 2.64 ERA (152 ERA+) in 99 innings. The kid was good. The next year, he went 17-9 with a 2.69 ERA (153 ERA+). In 1958, the Dodgers moved to L.A. The California boy went home. In 1959, he won 17 games and led the Dodgers to a World Series title against the Chicago White Sox. His 242 strikeouts were the most by a National League pitcher in 35 years. Over the next decade, Drysdale solidified his Hall of Fame career. He only led the National League in wins once, but he led it in strikeouts three times. No. 53 struck out a career high 251 in 1963. He topped the 200 strikeout mark six times. In 1962, Drysdale won 25 games and took home the Cy Young Award. He finished fifth in the MVP voting. Big D and Koufax led the Dodgers to World Series championships in ‘63 and 1965. They didn’t get much help from the offense. The Dodger attack was about as scary as your cousin Sissy’s pet beagle. The Dodgers made it home about as often as Robinson Caruso. Drysdale probably put up his best year in 1964. He compiled an 18-16 record, but he tagged a 2.18 ERA (147 ERA+) onto that over 321.1 innings, a career-high. He gave up an average of just 6.8 hits per 9 innings, a career low. In 1968, in his next-to-last season, Drysdale set a Major League record. He threw 58 2/3 consecutive scoreless innings and put up a 2.15 ERA (128 ERA+). And, if threw a few extra spitballs that year, well, then so be it. He wasn’t the only one. 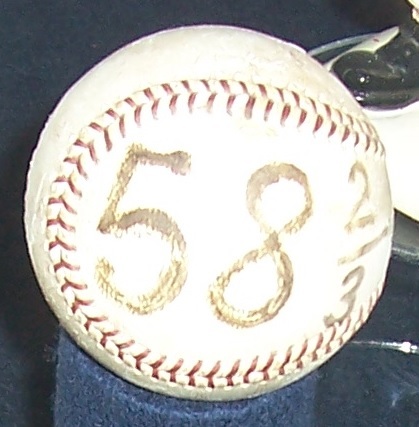 PM800 photo/This is the game ball that Drysdale used to record the final out in his record scoreless streak in 1968. Big D started off 5-4 in 1969 with a 4.45 ERA. His strong right shoulder had thrown enough. He called a press conference, shed some tears and said he was done. Drysdale, the L.A. guy who looked a movie star, retired with a 209-166 record and a 2.95 ERA (121 ERA+). No. 53 tossed 49 shutouts and hit 29 home runs. He took the ball every game and led the league in starts from 1962-65. He made eight All-Star teams.